Discussion in 'Guitars in General' started by WoodenDuckMaker, Apr 17, 2016. This is a very inexpensive Hondo strat copy, so I can't spend what the guitar is worth to have a pro fix this, so i'm looking to do it myself. Dent looks small, but every time I bend the string on or near that fret the string kinda gets caught over it and it's very annoying. Was thinking of just slowly filing it down until it's smooth and I don't feel it anymore. Would that be okay? I just hope it won't make the fret uneven with the others. That's exactly what it will do. Silver Hand and songtalk like this. Cover fretboard around the fret with painters tape. File fret. Polish with steel wool. scott944 and Baxtercat like this. I wouldn't file fret. Id hit it with 2000grit then polish with dremel. frankencat and Stratobuc like this. I have never tried this but I have read that it is possible to fill dented frets with solder. I guess the solder would be quite soft compared to the fret material but I imagine it may work to smooth out a small dent like that. Just a suggestion and please proceed with caution, but it is something I would be tempted to try on a cheaper guitar like that. Good luck! i have a small dent like that on one of my frets….will try the 2000 grit approach. Let's assume that's fret #5. If you file or sand it until the dent is removed then the #5 fret will be lower than all the frets from #6 on up. 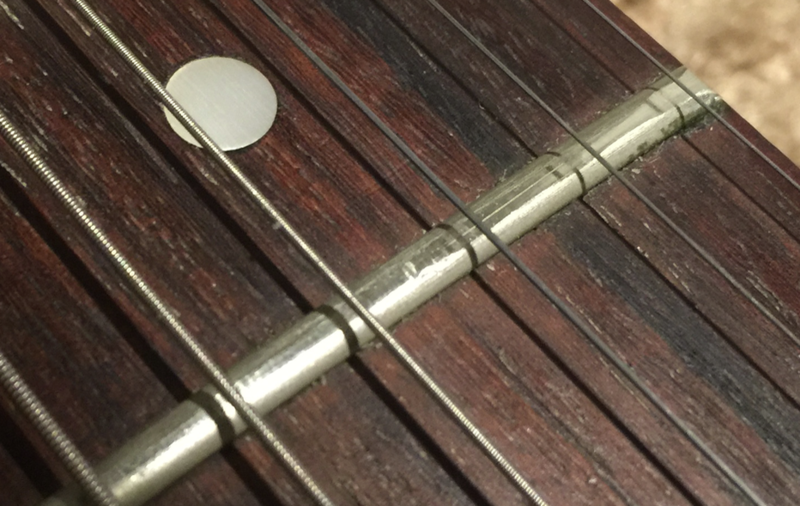 You'll get fret buzz every time you press a string down on fret #5. What you'll need to do is do a fret level from #5 on up. Then crown them and then polish them. I'd probably be tempted to do a fret level on the whole fingerboard, crown them all and polish them all. If you have a fret crowning file you might try crowning that fret until the dent is gone and then polishing it. Maybe you'll be lucky and not have to do more. halcyon and Bob Pollock like this. It looks like it could use a fret dressing, so I'd get a level and crown unless the guitar really isn't worth anything. I agree. If it was my guitar that's just what I'd do. Of course, I would just do it myself. Don't know what a good tech would charge. Try using something hard, round and smooth to try to burnish that ding out - I've done that a time or two. Sand the dent with very small piece of wet/dry, 1000 or better. Just like you're sanding a spot of wood. Then buff it with a small wahd of soft fine steel wool. ef_in_fla and Smakutus like this. It looks like it is between the strings and small. Just round off the edges with fine abrasive and you will never notice it. There are lots of guitar with deeper divots than that right at the note position. great-case.com and Baxtercat like this. I have never tried this but I have read that it is possible to fill dented frets with solder. It is also possible that I am the Queen of England. Just polish it out with 600 wet or dry sandpaper.... after you've masked the fingerboard with tape. Don't use steel wool - it's not aggressive enough for this dent, and the crumbs that scrub off will stick to your pickups. zeffbeff and ef_in_fla like this. Yes sand just the dent until it's smooth, not the whole fret..
RicardoDiazHimself, Silver Hand and 9fingers like this. Kit actually works pretty well. Levels and crowns the frets. More than adequate for inexpensive-mid level guitars. I have used it on many of my own guitars when the frets become flattened. Even with a cheapie I'd take it to a shop and have the fret replaced. I have done it many times and it works. In fact, I just did it a few days ago. However, on that one you might try the above and tape it off and sand it with some 000 or 0000 steel wool. Just enough to where the string no longer "catches" on it. fret, but it may be higher elsewhere. If it were mine, and I didn't want to go to the trouble of leveling and dressing all the frets, then I might try filling the dent with JB Weld. Leave the epoxy a little proud then file it level with the fret after it cures.